Well, here we are back together after a short absence of… … 14 or 15 months. When last I posted, I was working for the Brewmaster program at Niagara College. However, much has changed in the past month: Elaine and I recently decided it was time for both of us to hang up the gloves and retire, so three weeks ago, I officially entered my “golden years” — which mainly seems to mean finally getting a lot of chores done around the house. 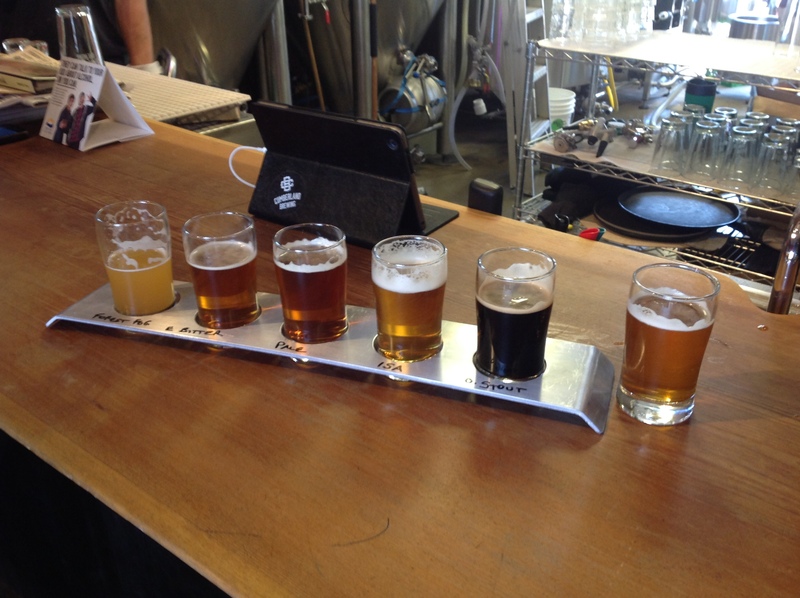 Then yesterday I visited a new brewery, and suddenly I realized that I now have time to post some new blog entries. So onward…! Your best bet is probably the city of Nanaimo, about 115 km (70 mi) to the south. However, if you feel lucky, you might instead head north to Campbell River, which is much smaller than Nanaimo, but only about half the distance. 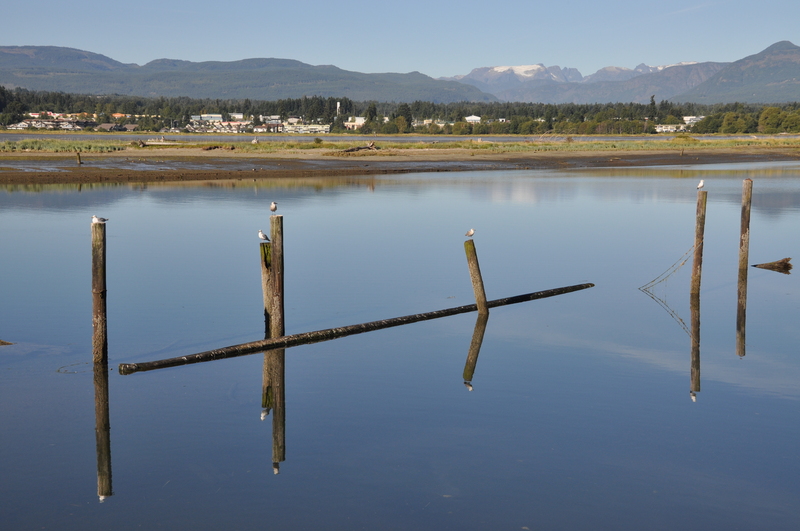 Campbell River is the self-styled “Salmon Capital of the World”. Apparently if you’re the sort of person who goes out on the ocean in a small boat looking for tyee salmon armed only with a rod and reel, Campbell River is the place to be. Elaine and I, not in urgent need of fresh salmon, but searching for a small widget unavailable in Comox/Courtenay, had decided to try our luck in Campbell River, and arrived around lunch time. As I drove down the main thoroughfare, Elaine trolled Google for places to eat. Google undoubtedly has a pretty good read on where I like to eat, because what it offered up to us was Beach Fire Brewing & Nosh House, a brand-new brewpub. It looked very modern and inviting from the outside, so in we went to order a flight of beer and some food. The interior is large-ish, high-ceilinged and open, with a couple of communal harvest tables that seat 6-8, and several smaller tables for 2-4. With another half dozen chairs at the bar, there is probably seating for about 30 people. 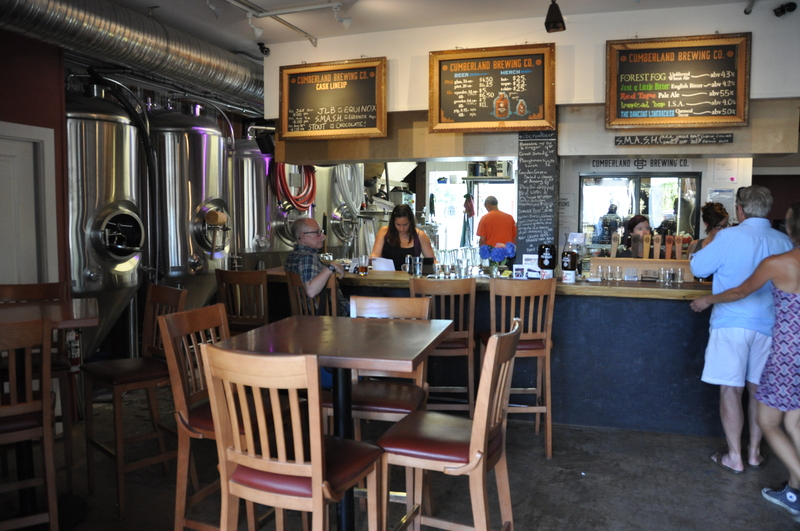 Elaine has seen the inside of a lot of brewpubs and usually finds the decor to be very uninspiring — kind of a masculine “shut up and drink your beer”. However she was very impressed with Beach Fire’s look, which she found very modern and pleasant. She felt a lot of thought had gone into the aesthetic of the place, from the blown glass art on the walls, tables made from slices of tree trunks, and hanging lamps that look like hop cones. 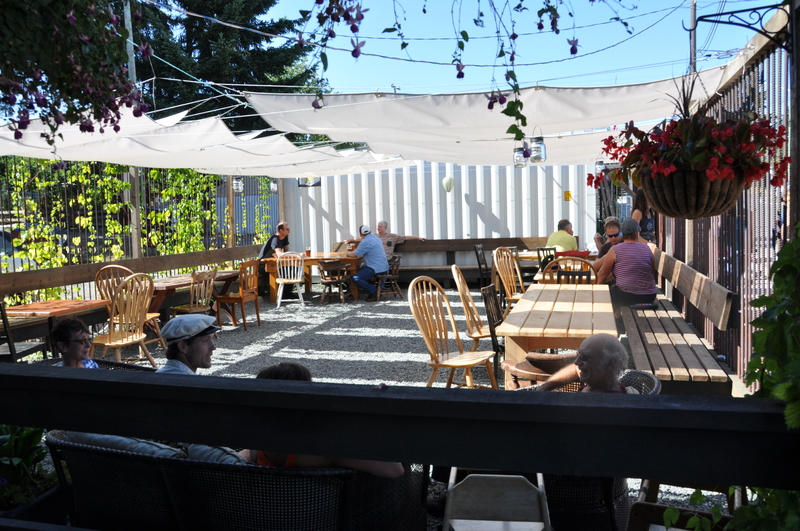 Beach Fire is the brainchild of three Campbell Riverites who bemoaned the lack of craft beer in the area. 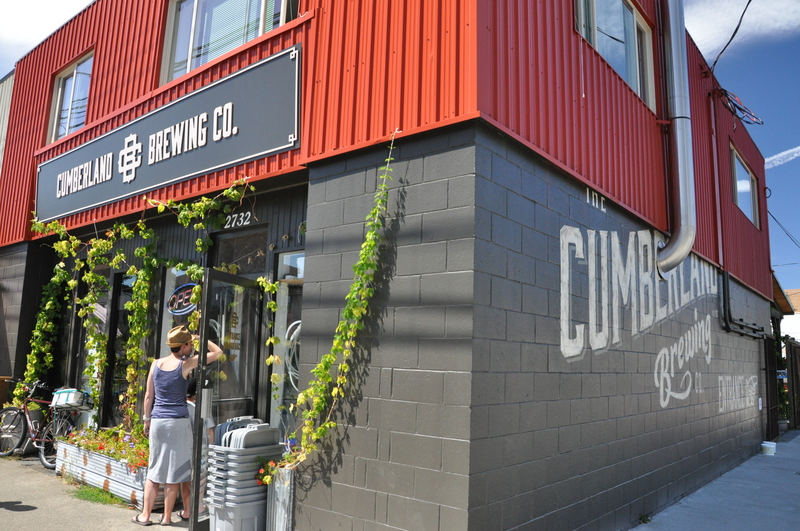 Knowing that some of their friends were driving 55 km (35 mi) from Campbell River to Cumberland Brewing just to get their growlers refilled, the three partners decided a brewery would thrive here. The local town council, which has been trying to get some new business into the area, were on board with the idea, and without too many misadventures, the brewery opened in October 2016. A flight of the blonde, red, pale and stout. There are four regular beers on tap: a blonde, a red, a pale ale and a stout. (No IPA? Whaaa…? I thought there was some sort of provincial regulation stating that all BC breweries had to produce an IPA.) All four beers are competently made — no surprises, no issues, not a lot of complexity, just basic good beer. I was able to have a chat with the brewer (and one of the three founding partners), Darrin Finnerty. He is a former homebrewer who has travelled the very difficult “homebrewer goes pro” road while putting together a nice-looking 12 hL 2-vessel Specific Mechanical system. The brewhouse does have some production limitations: he only has four single-batch fermenters, one for each style of beer, and only four serving tanks in the cooler (again, one for each style of beer). This only allows him to make the four basic beers currently on tap; if he and his partners decide to produce a new style of beer, they will have to drop one of the four. Darrin did point out a couple of glass carboys on the floor — he’s thinking about bringing in his homebrew system and whipping up a few casks of creative content from time to time, just to give the customers something new from time to time. Still, this is another brewery where the start-up team were very conservative in their estimate of how much beer they would sell. Now with things really flowing, I’m sure they wish they had more fermenters to increase their brewing capacity. 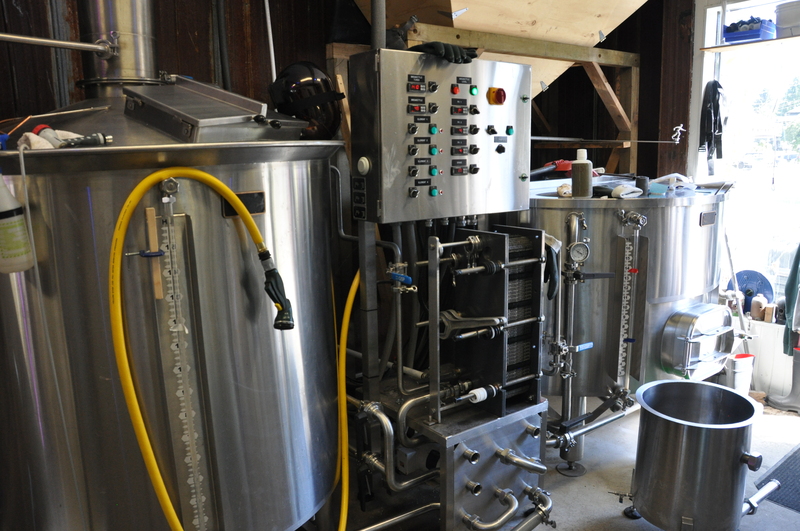 Beach Fire’s tidy 12 hL brewhouse. 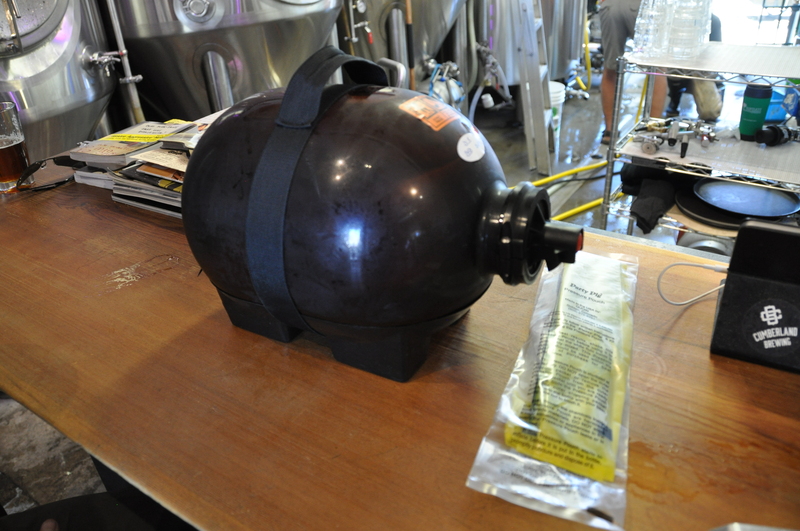 No HLT yet, and the single-batch FVs don’t leave much room for future expansion. The other very evident issue with the brewhouse is the lack of a hot liquor tank (HLT). Just as your home’s hot water tank ensures you have enough hot water for your shower, the dishes and your other daily needs, so a brewhouse’s HLT provides enough hot water for the day’s brewing. (One of the questions my Brewing Calculations students had to answer last year while designing a brewery was what volume of HLT was needed.) Unfortunately for Darrin and his partners, their budget came a little unglued during the construction phase, and what got dropped from the brewhouse plan was an HLT. Without one, Darrin has to get a little creative. Before he starts brewing he obviously has an empty fermenter waiting to receive a batch of wort. So Darrin uses the empty FV as a temporary HLT: he heats water in his kettle, and transfers it to the empty fermenter. 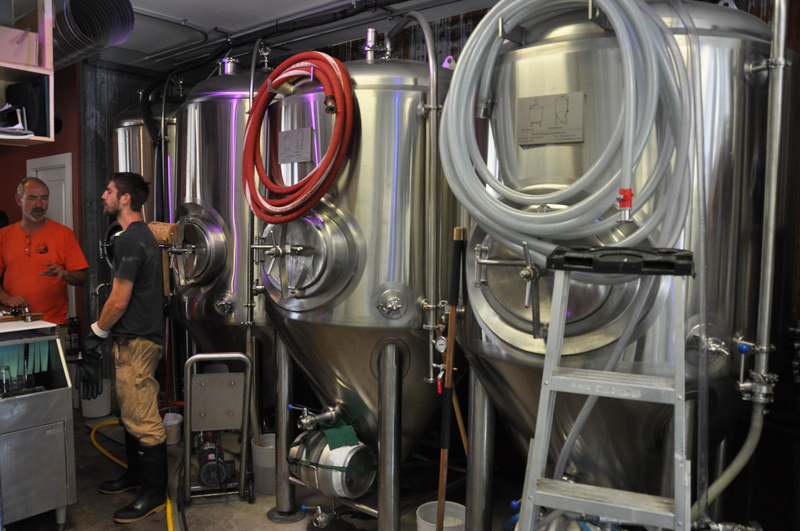 When he needs hot water during the brewing process, he transfers it from the fermenter to the mash tun. By the time he’s finished brewing, all the hot water has been used up, the fermenter is empty again, and Darrin can transfer the new wort to the empty fermenter. Of course, lack of an HLT is going to be a limiting factor if Beach Fire wants to ramp up production, so hopefully an HLT is high on Beach Fire’s shopping list. The cooler was very large — perhaps, given the lack of floor space out in the brewhouse, the cooler is a bit too large at the moment. Hopefully as an HLT and larger FVs come on-line, there will be more beer in the cooler too. 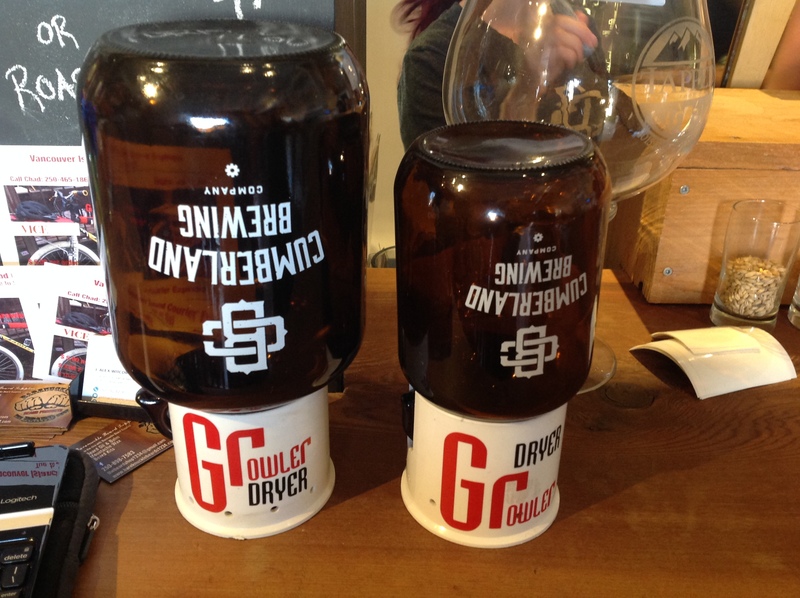 In addition to beer by the glass, Beach Fire also does growler refills, albeit from the tap rather than using a proper counter-pressure growler filler — something else for the future shopping list too. It’s also obvious that the kitchen side of Beach Fire has received equal attention: the food menu, which changes daily, is creative, with an emphasis on small “sharing plates” (aka “tapas”) to go with the communal feel of the tables. Looking for a lighter lunch, we ordered ale-braised sausages with bacon sauerkraut, and chips with salsa. There’s also an extensive dessert menu (yay!) with items like “Cape Mudge Foggie” and and Apple-berry Walnut Crisp. Looking for another sharing experience, Elaine & I settled on the Lemon Cheesecake with Blueberries, which turns out to be delicious. Great food, a very convivial atmosphere and well-made beer — I assume Beach Fire is well on its way to being a local focal point for both craft beer lovers and foodies. If that happens, the only issue for Beach Fire will be how to keep up with demand for their beer, and possibly how to offer more types of beer than their current stable of four styles. It will be exciting to see how they respond to the challenge. We must visit again… often.